This is a Chinese name; the family name is Yeung. 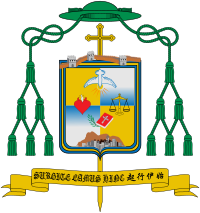 Michael Yeung Ming-cheung (Chinese: 楊鳴章; 1 December 1945 – 3 January 2019) was the 8th Roman Catholic Bishop of Hong Kong. He was consecrated on 30 August 2014. Yeung Ming-cheung was born in Shanghai in 1945. He completed his primary and secondary schooling and began working for an import-export company in Hong Kong. In 1972 at the age of 26 he entered the Pontifical Urban University to study theology and philosophy and graduated in 1978. He was ordained a priest for the diocese of Hong Kong on 10 June 1978. After his ordination he took a variety of pastoral and administrative roles. From 1978 to 1980 he was vicar in Ha Kwai Chung District, New Territories; from 1980 to 1982 he earned an MA in social communications from Syracuse University in the United States. In 1982 he returned to Hong Kong and was appointed director of the office of Social Communications for the diocese. He held this post until 1986. Subsequently he was appointed as parish priest of Our Lady of Lourdes parish, where he served until 1989 when he was appointed chaplain at Yu C.K. Memorial College. He returned to the United States to study at Harvard University where in 1990 he earned a Master's in Education (Ed.M.). He returned to Hong Kong in 1990 and held the post of director of the office of education until 2013. He was the head of Caritas Hong Kong and was appointed vicar general of the diocese in 2009. He was later appointed a member of the Pontifical Council Cor Unum. On 27 June 2018, AsiaNews reported that Yeung had tendered his resignation to Pope Francis in order to dedicate himself to Caritas. However it was later reported as a misunderstanding since he merely informed the press of his future retirement plans not his actual retirement. He received two honourary doctorates: one in Social Science from the Open University of Hong Kong, and another one from the Australian Catholic University. Yeung reportedly tripped over his alb and injured himself when stepping upstairs before celebrating a Mass in December 2018. He made his last public appearance when he celebrated the Christmas Eve Midnight Mass at the Cathedral of the Immaculate Conception the same month. Beginning 27 December 2018, Yeung underwent treatment for liver failure brought on by cirrhosis at the Canossa Hospital. He died at 1:30pm (Hong Kong time) on 3 January 2019 from the illness. Following Yeung's death, the sole auxiliary Bishop Joseph Ha Chi-shing became in charge of administering the diocese. Before the board of consultors could elect a diocesan administrator, Cardinal Tong was appointed apostolic administrator to be the acting head of the diocese until an appointment of a new bishop by the Roman Curia, in accordance with the church's Canon law. Throughout his career as a Catholic clergyman, Yeung was at the center of various controversies. Yeung was criticized for comparing participants of the 2014 Hong Kong protests, as well as homosexuals, to those who use drugs. Yeung's close ties with Carrie Lam, the 5th Chief Executive of Hong Kong, has also been a source of controversy. Yeung said Lam is a Catholic, and he has had good ties with Lam for years. Yeung also said he has known Lam on a professional level, during her time as the Director of the Social Welfare Department, and that he has no reasons to reject her, and sever ties. Yeung's cosy ties with the rich and powerful in Hong Kong has also been a source of criticism. Yeung has also been criticized for allegedly defending mainland Chinese authorities during a news conference over controversies concerning the removal of crucifixes from church buildings or demolition of churches. He also said that, since China has regulations on religion, he will respect their rules. ^ "Hong Kong: Three new auxiliary bishops ordained". O Clarim. Macau. 19 September 2014. Archived from the original on 8 January 2019. Retrieved 8 January 2019. ^ a b "Nomina di Ausiliari di Hong Kong" (Press release). 13 November 2016. ^ a b "Bishop of Hong Kong passes away - Vatican News". www.vaticannews.va. 3 January 2019. Retrieved 3 January 2019. ^ Brockhaus, Hannah (13 November 2016). "Pope Francis appoints new bishop of Hong Kong". Catholic News Agency. Retrieved 16 November 2016. ^ "New bishop succeeds in Hong Kong". Vatican Radio. 1 August 2017. Retrieved 3 January 2019. ^ 楊鳴章提早請辭主教「返明愛工作」理由牽強. Apple Daily (in Chinese). 27 June 2018. Retrieved 27 June 2018. ^ "Bishop Yeung of Hong Kong denies resignation report". 28 June 2018. Retrieved 4 January 2019. ^ "【楊鳴章病逝】新主教要有中共「祝福」？ 杜國明：等教宗決定". Apple Daily (in Chinese). 3 January 2019. Retrieved 4 January 2019. ^ "Media Notice". Catholic Diocese of Hong Kong. 3 January 2019. Retrieved 3 January 2019. ^ "Hong Kong Catholic leader Michael Yeung Ming-Cheung dead at 73". South China Morning Post. Retrieved 3 January 2019. ^ 新主教楊鳴章:無理由不與林鄭來往 [New Bishop Michael Yeung Ming-cheung: I have no reasons to cut off ties with Lam Cheng]. Hong Kong Economic Journal (in Chinese). 2 August 2017. Retrieved 8 October 2017. ^ 楊鳴章說與林鄭月娥認識多年　無理由不與她來往 [Michael Yeung Ming-cheung said he has known Carrie Lam for years, has no reasons to cut off ties with her]. RTHK (in Chinese). 2 August 2017. Retrieved 8 October 2017. ^ "New Hong Kong bishop's cross removal comments sparks anger". Union of Catholic Asian News. 4 August 2017. Retrieved 8 October 2017. ^ Zhen, Shuji (3 August 2017). 新主教杨鸣章：平反六四"是面铁墙"不会撼头下去 [New Bishop Yeung Ming-cheung: Rehabilitating June 4th "is an iron wall", and will not confront it directly]. Radio France Internationale (in Chinese). Retrieved 8 October 2017. 谈到惹起纷争的浙江温州拆卸天主堂十字架事件时，杨鸣章似乎还为中共作出袒护，他说内地近年频拆十字架，他认为问题较复杂，"是否关乎建筑物安全，都可能会……"
^ 楊鳴章稱內地拆十字架的事情複雜　尊重當局訂出的規條 [Michael Yeung Ming-cheung said the destruction of crosses in the Mainland is a complicated issue, will respect the rules set by authorities there]. RTHK (in Chinese). 2 August 2017. Retrieved 8 October 2017. This page was last edited on 20 February 2019, at 10:38 (UTC).